My mom told me a story the other day about my grandmother (her mother). It came up in the context of Evangeline, as my mother remarked at how astounded her friends were with Evangeline’s eating habits. From the day she was born, I haven’t had to worry about my daughter eating – she nursed so voraciously that more than one nurse mentioned videotaping us to show other new, nursing mothers. 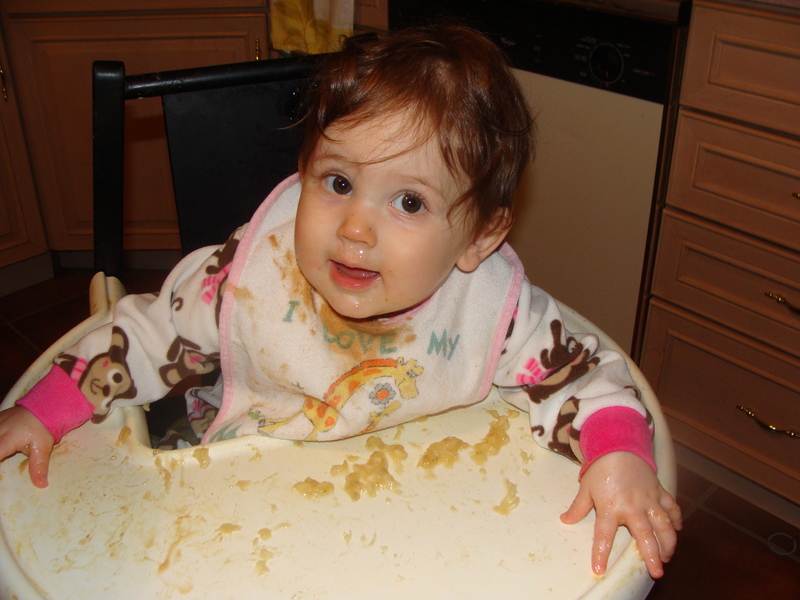 At three months, Evangeline tried stealing eggs off of our plates and now, and nineteen months, she gobbles up Greek yogurt, peas, grapefruit and pesto-slathered chicken with joy and gusto. I am prepared and indeed, expecting, a day where she will only eat orange food or noodles and cheese but so far, with the exception of green beans and red meat, Evangeline has shown a deep and abiding appreciation for all the food the world has to offer. “I didn’t realize grandma worried about her weight,” I said. My maternal grandmother certainly had some curves in her younger years but in all the pictures of her I’ve ever seen she had a beautiful, glamorous figure. I knew her as a great lover of food – rare prime rib dripping with homemade horseradish cream, lemon merengue pie with the merengue piled “a mile” high, chicken wings smothered in blue cheese dressing were just a few of her favorite foods to eat. “Oh, she constantly worried about it. One time she read in a magazine that banging your hips into the wall as you cooked made you slimmer. She did that for a year before realizing it didn’t work,” my mom said. Can you imagine? Banging your hips into a WALL, over and over and over again? Really, sometimes there just are no words. Even though it was said in passing, it helped me to hear my mom recognize the various and sundry diets she and my dad put my brother and me through as kids. Sometimes we were vegetarian, and sometimes not – occasionally my dad had flings with lower-carb diets like Atkins or South Beach. The diet that lasted the longest was the low-fat craze so many people in the eighties grabbed on to when suddenly everyone started worrying about cholesterol. Open my parents’ refrigerator door and you will find evidence of all of these diets – boca burgers, fat-free cheese, sugar-free ice cream, fat-free half and half, salad dressings made up more from chemicals than from actual food. The food of my youth. I can remember two different times in my life when I haven’t been on a diet, and looking back, I was either at my healthiest or slimmest during those periods of time. The first time was during my junior year in high school when it seemed like all of my friends, including my best friend, were on some sort of extreme, potentially anorexia-inducing diet and I just couldn’t handle any more conversations about weight and waist size, deciding instead to eat whatever I wanted but just until I began to feel full. I hadn’t been heavy to begin with – at the time I was extremely involved in theater and dance – but the weight I lost just from listening to hunger cues was startling. I managed to maintain that particular relationship to food for years, until a period of crippling depression and anxiety, brought on in such a cliched way by the 9/11 attacks and exacerbated by months of unemployment and anti-depressent medication, caused me to turn to food in a way I never, ever had before. If I start talking about that period in my life it’s possible I will get incredibly off-track so I’ll save our year in West Virginia for another day and time and simply say I lost *much* of the weight I gained during that period but not all of it – a stubborn 15 – 20 pounds have remained despite constantly dieting. The second (and last) time I wasn’t on a diet was during my pregnancy. I sort of feared pregnancy-induced heartburn since I heard so many wicked stories about it and thus ate very small portions throughout the day. I also followed every single pregnancy food rule you could imagine, from avoiding soft-serve ice cream and lunch meat (listeria!) to eliminating almost all fish (which made me sick, anyway) and the end result was a net gain of 24 pounds over the course of the pregnancy, while feeling like I could eat anything I wanted, really. That weight was easy to lose, but still leaves me between 15 -20 pounds above my ideal weight. I’ve worked hard at losing this weight, to limited success. I workout regularly, I chase my one and a half year old around the house for hours at a time, I never buy ice cream or make cake or huge lasagna dinners or anything, and yet the extra weight remains. I think this is due to several factors, including a somewhat, although not entirely, sedentary job, obviously not eating the right food all of the time, and the inability, or lack of desire, to make losing this weight my very top priority. There needs to be some ownership here, after all. In the last couple of weeks, I’ve found myself facing overwhelming diet fatigue. I am tired of exercising in order to gain “activity” points and I’m tired of, on days when I am especially hungry, not having the ability to eat to satisfaction, and I’m tired of worrying about protein to carb ratios and thinking, if I want an apple, that I had better eat a “protein” with it or else it will just disolve into sugar that will throw a party on my pancreas. What I want to do, more than anything else, is eat like a normal person – like my most slender friends do. The more and more I thought about this, I realized I could stop dieting. I mean, it is well within my power to do so – the only one who cares about my protein to carb ratio is me. I could, instead of berating myself every day for having flabbier abs than I would like, be proud of my body – of its incredible energy, flexibity and capabilities. Instead of cursing genetics for what I haven’t been blessed with, I could thank God for what He has given me. I could begin looking at yoga, swimming and dance classes as things I do because I love them (which is true) and not activity points to be translated into food points. I could…see what happens. And so – that is what I’ve decided to do. In the interest of full disclosure, I have decided I need to weigh myself every day, in defense against that one year in West Virginia – this is NOT permission to pound pepperoni pizzas and hamburgers and such, like that one year I did just that. Instead, this is an attempt to see if I can break the chain of dieting and weight loss tricks that have been passed down to me through generations of white anglo-saxon women. It’s an attempt to free up some brain space to think less about calories taken in and calories burned and more about reading great books and finally submitting some writing. It’s an attempt to make the next 35 years of my life about something other than how much I weigh or whether I’m a size 8 10 or a size 12. I make no promises that I am going to be able to achieve giving up dieting. I’ve been conditioned for decades at this point to worry about my weight, and to chronically try to lose some. But I’m going to give this a chance – I’ll let you know how it goes. This entry was posted in Do I Dare to Eat A Peach, Uncategorized. Bookmark the permalink. Good for you! This is so inspirational! I have spent my life obsessing about my weight. It started when I was in high school and bigger than the other girls. I was a size 12 – which I would kill to be now! I’m so mad that I ever thought 12 was heavy and that my mindset at the time pointed me down this spiraling path of a lifelong obsession with my weight. I am eager to hear how this goes for you and maybe I can find some inspiration from your journey. Like Jen, I find this inspirational! I have spent my entire life thinking I was fat, even when I was at weights I never expect to see again. As a college freshman, I thought 135, size 10, was obese. After having a child, I thought 145 was elephant-sized. Now, either of those would be a dream. Actually, I think I would be too thin at 135 and look astonishing at 145. I would just love to be 20 lbs lighter, even though it seems like light-years away. Courtney, I could have written every single word in your post. Thank you for doing it for me. I am exhausted and depressed by the brain space I commit to thinking about food, eating, dieting, my body shape, exercise or the lack of it. I also recently told myself that that was it – dieting was over. Now begins the retraining, the listening to my body and eating for it, not for my emotions. If you want to share a post on how you achieved that, I would love to read it. Yay Courtney! You go! I am a firm believer of not dieting. Eat good food, real food, in moderation and get some exercise and that’s it, that’s my philosophy and it has done well for me. Good luck! Huzzah! Pregnancy has forced me to stop eating when I’m full, because otherwise — heartburn city. I gained 20 lbs after college (I swear sedentary jobs are the culprits… and being able to afford wine) but I’ve only been on two real diets in my life, one before my wedding and the other earlier this summer. I hated thinking about food in those terms. Right now I go back and forth between concerns about having lost weight in the first trimester and worries about gaining a LOT of weight in these next several months. I’m hoping to just follow your same strategy… eat good food when I’m hungry, stop when I’m full, and don’t obsess. Oh, this is wonderful. I finally have begun – just begun, mind you – getting on the way to where I want to be by following two guidelines. One is “Fewer calories, more exercise”. Every day I try to reduce my total calories just by passing by that second piece of toast, or the second helping of whatever, and I take stairs rather than elevators, park farther away from stores, etc. The other thing I’ve started doing is eating really high quality food. For example, I love ice cream. I’ve spent years trying to keep my obsession with it under control by going for frozen yogurt, sugar-free, and so on. The only problem is, it’s never very satisfying, and I eat more of it than I should. I started eating Talenti gelato, and my gosh! The five dollars for that little container is worth every cent, because I can be completely satisfied with a half-cup serving. Quality trumps quantity every time! This post breaks my heart. Thank you for sharing it. My only eating rules of thumb are to eat fresh unprocessed food most of the time, to stop eating the moment I feel sated, and never to judge. Eating should be a pleasure, and a time of gratitude. I hope you can experience the joy that comes from celebrating the good things that grow and nourish our bodies. Anne – I sometimes think those of us with 20 pounds to lose make it seem like 200 – like “Oh my God, I am part of the obesity epidemic!” or some such, which is so not the case. We shouldn’t make 20 pounds feel like an unclimbable mountain – we should concentrate on enjoying life more and stressing less! Oh, I think this is so sensible. Earlier this year I decided to cut the mental link between food, guilt and exercise, so that food was never either a sin or a treat, it was just food. And exercise was something I either did or didn’t do, but wasn’t related to what I ate. The net result has been that physically, nothing seems to have changed (I don’t have scales but my clothes all seem to fit the same) and I’m just as physically fit as I was anyway. Charlotte – Can you imagine the things we could accomplish if we successfully free up our brain space from tackling different diets (or, um, lifestyles) and gave all that space over to our writing, our jobs, and our family? I am in week three of this and while I still do tally my average daily caloric intake in my head, other than that I’ve been able to relax about food and exercise…oh, still exercising a lot (I need the time to think) – but it’s not to “earn” food anymore, and that’s amazing. Carrie – not to worry, I lost weight in my first trimester too – don’t worry, it comes back, LOL. That nausea is killer and makes food extraordinarily difficult. Anyway, you are such a beautiful mama -to-be, you just enjoy this pregnancy as much as you possibly can! And I am really glad you and K are off the paleo kick…it seemed quite depressing. Shoreacres – yes, exactly..passing on that second piece of toast, walking more than before, choosing quality foods – these are all choices that help us be the very healthiest we can be – not crazy yo-yo dieting and the like! Alison – welcome, and thanks for such a warm comment! So far the transition is going very well and I am certainly happier, and I think getting *more* exercise, than I was before! I look forward to getting to know you!